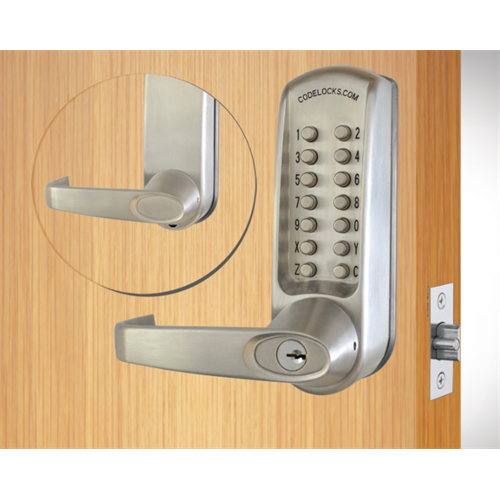 Codelocks CL600 series locks are premium heavy duty mechanical door locks providing simple code based access control and full size lever handles. The latch/bolt is moved manually from outside after entering the correct code, and can always be moved manually from inside. 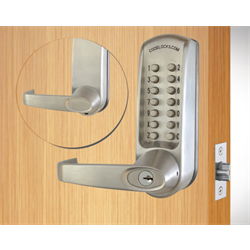 Locks can be used on left or right handed doors and come preset with a random code. Code can be changed conveniently without removing the lock from the door. Lock codes are non-sequential, meaning 1234 is the same as 2314 or 1342. The user may select the number of digits (length) of code. CL615 version includes 'Code Free' Option allowing the user to temporarily bypass the code requirement for free entry.